Anyone who has read my blog for any amount of time knows my undying devotion to Meijer grocery stores… as well as the fact that I’ve never been a huge fan of Aldi grocery stores (for many reasons). However, right around the time Clara was born, I started disliking a few things about my Meijer shopping experience (more on that below) and just a couple months later, a brand new, much nicer Aldi store opened up less than 10 miles from our house. 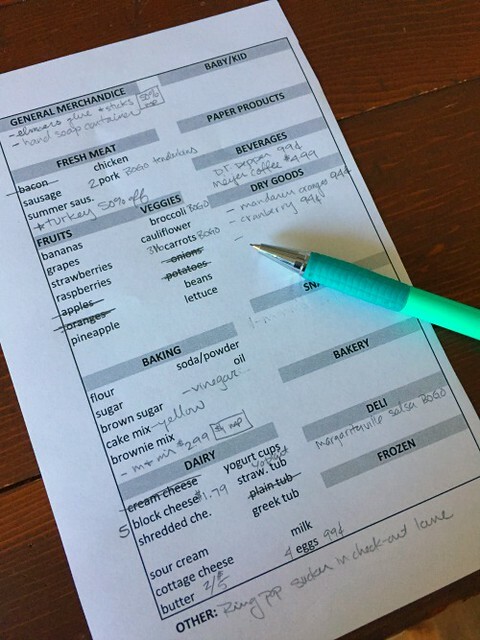 After several months of trying Aldi one time here, one time there (and still disliking it) I finally gave myself a self-imposed one-month challenge to essentially do as much of my grocery shopping at Aldi as I possibly could… today, I’m sharing the results! 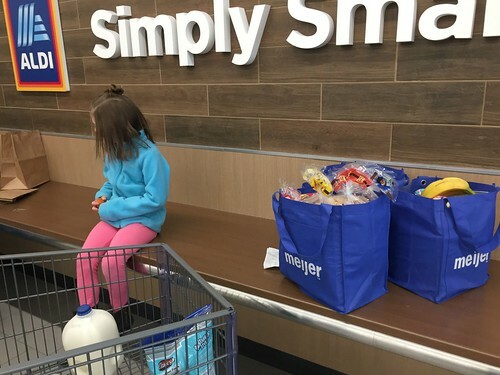 For my entire adult life (roughly 14 years), Meijer has been my sanity-saving, one-stop-shop, go-to grocery store… and before then, I always went to Meijer with my mom, so I definitely won’t be kicking Meijer grocery stores to the curb any time soon. 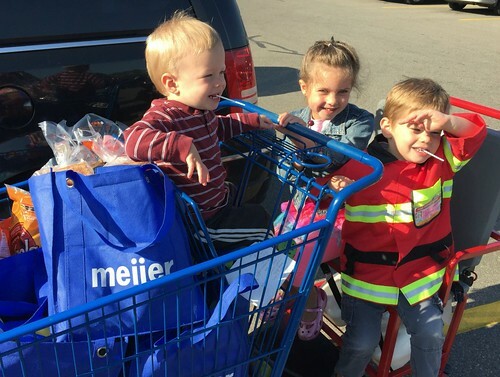 And speaking of “curbs”, Meijer’s fabulous curbside pickup service was a life-saver for me when James was a baby and Dave could pick up the groceries on his way home from school. However, Meijer has since doubled the per-use fee for their Curbside service, which personally made it less of a bargain for me… so I never used it after Clara was born. 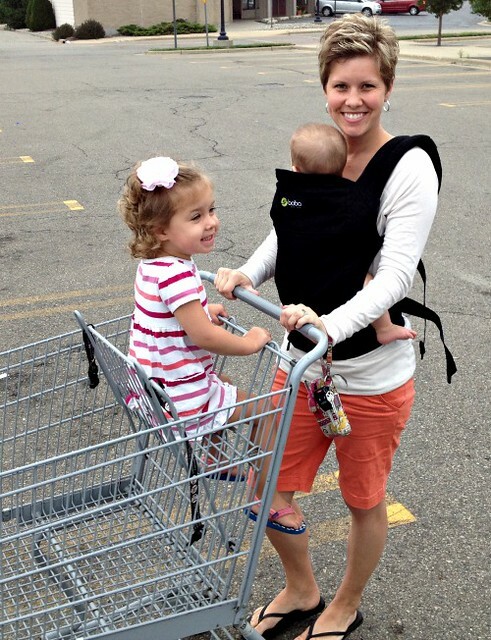 Also, right around the time Clara was born, Meijer partnered with the Shipt Grocery Delivery service. I briefly looked into using Shipt, but there is an annual fee to use Shipt, plus the groceries are roughly 15%-17% more expensive, plus I’d need to tip the delivery person, and I wouldn’t be able to use many of my digital coupons — needless to say, it was a no-go for me. 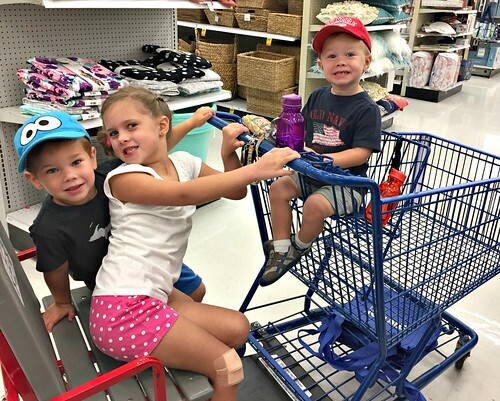 So I was back to grocery shopping again, and this time with 4 children (including a fairly fussy newborn who hated being in her carseat) — not exactly my idea of a fun time! I started to dread grocery shopping and was so grumpy and stressed out when I got home. I almost always went on a day Nora was in school, and I tried to coordinate it with Clara’s nap, but it was still a nightmare almost every week. Well, actually… just the checkout lane was a nightmare. I started timing my shopping trips and found I was averaging 20-25 minutes in the store to get ALL my groceries, and then another 15-20 minutes in the checkout lane (seriously, it was ridiculous). Every single checkout lane was clogged up with Shipt shoppers who were trying to be efficient (good job!) and checking out multiple orders in a row. If you’ve ever gotten behind a Shipt shopper checking out multiple orders in a row — and completing the extra paperwork that each order involves — you know it takes extra long. And if you’ve ever gotten behind a Shipt shopper taking extra long while trying to calm a fussy baby and entertain 2 toddler boys who insist on touching EVERY SINGLE THING in the checkout lanes, you most definitely share my frustration! My temporary solution was to get groceries at 9pm on a weeknight or 5:30am on Saturday — both of which were OK options, BUT there was only ever ONE checkout lane open at those times, and if 3 or 4 other shoppers were in the store at the same time, we still had to wait a fairly long time to finally check out. 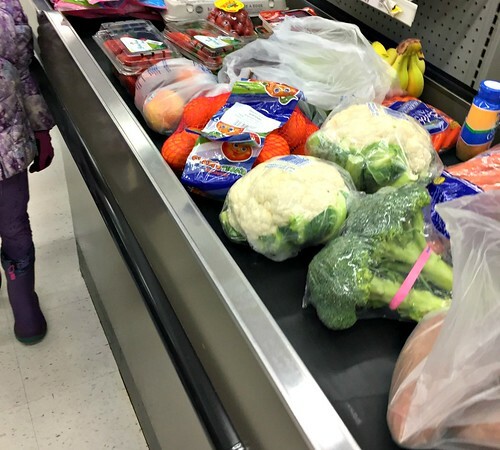 Right around the holiday season (when the stores were even busier) I realized my weekly grocery shopping was causing me unnecessary stress, taking up tons of extra time, and… that I no longer loved shopping at Meijer. Over Christmas break, I told Dave I wanted to try the new Aldi store… and while the store was very nice and the staff was very capable, I still hated shopping there. I tried it twice over Christmas break, and both times, I left feeling like I could only get half of what I needed, and ended up spending MORE in the long-run because I went to Meijer and Costco too, and spent significantly more time than I would have if I had just stuck to shopping at Meijer. I was super frustrated and vowed that Aldi just wasn’t for me. I continued to stand in the LOOOOOOOOOOOONG lines at Meijer, while all my friends (and blog readers) raved about how quick and efficient their Aldi shopping experiences were. I needed quick and efficient! So I tried Aldi a couple more times after the New Year, and realized that even though I couldn’t get everything I needed or wanted, it WAS very quick and efficient. I also took a look at our Finance Tracking Workbooks from previous years and realized we were spending a HUGE amount on groceries — in fact, groceries was our largest monthly expense for 2017!!! Then, after spring break, I decided to “bite the bullet” and swear off Meijer for one month (well, not totally… but almost). I challenged myself to do as much of my grocery shopping as I possibly could at Aldi for one month, and see if I liked it any better. I just finished my one month challenge last week… and I’m happy to report, I no longer hate shopping at Aldi! 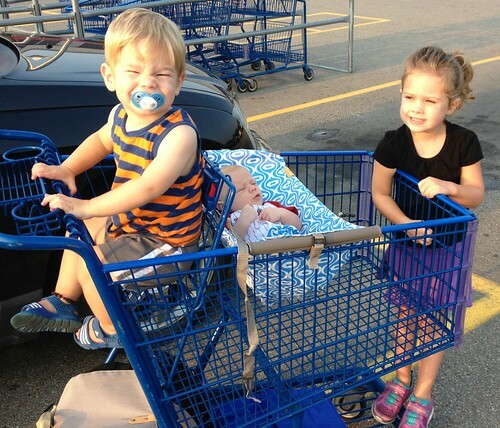 I’ve been going to Aldi one morning each week for the past 5 weeks, and since I always went on a morning Simon was gone at his 5-week preschool program, I only had 2 kids with me each time — Clara usually napped in her carseat while James sat nicely in the cart. I mostly got fresh produce, dairy, and bread (we got a quarter of a cow from Dave’s parents for Christmas and get most of our other meat from Zaycon Fresh)… then I headed to the checkout lane roughly 20 minutes after walking through the door. Of course, I can’t ever find EVERY SINGLE thing on my list, but I told myself we could do without some of those items for one month. Plus, the amazing speed of the checkout lanes was FANTASTIC! I could hardly get my items on the belt fast enough and they were already being scanned and put into the 2nd shopping cart. It was amazing! I bagged up my own groceries (which is more efficient and organized than anyone at Meijer could have done for me) and then was on my way! There are still lots of things I don’t particularly love about shopping at Aldi, but I think they are balanced out by my growing list of things I don’t love about Meijer (at least for this stage in my life with multiple little children in tow). I’m positive I will still utilize Meijer grocery stores — but I do think I will continue doing at least some of my weekly shopping at Aldi, especially during the Summer when Dave can stay home with some of the kids. So the biggest question… Did I save any money? This is fairly difficult to know for sure — my bill was definitely less expensive at Aldi, BUT I get all kinds of digital rewards, MPerks, and credit card rewards specifically for my Meijer purchases, so I usually see a significant post-shopping savings at Meijer, which I obviously don’t get at Aldi. Plus, I simply decided to go without the things I couldn’t get at Aldi for most of the month — and we obviously can’t go on like that forever… so I’d eventually need to go to Meijer more regularly for those items. That said, I certainly did not spend MORE, and I saved a significant amount of time (and stress) so I’d call it a WIN! I do feel like I should mention that a BRAND NEW Meijer store is currently scheduled to open this summer, only 2 miles down the road from our house! So, while I have definitely changed my tune about Aldi, I wouldn’t be shocked if I eventually switch back to shopping at Meijer based on the proximity of the store to our house! Who knows… we’ll see what the new Meijer store is like, how well they are staffed, and how quick the checkout lanes are. At least I’m fortunate enough to have so many great grocery shopping options and the ability to choose where I buy my groceries based on convenience. What a blessing! 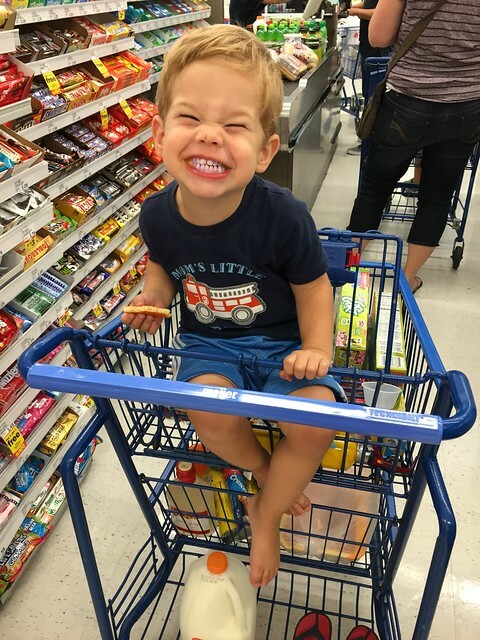 What about you… what do you like (or dislike) most about Aldi or Meijer? For some reason I like grocery shopping. I find it relaxing! I know weird, but it’s just me so I’m not rushed. I’ve always shopped at Jewel/Osco stores ( I worked at Osco for 15 years). I’ve tried Meijer and hated the produce layout with going back and forth. I also dislike the huge stores that you have to walk 1/2 a mile to get to the milk. I’ve only shopped at Aldi once, I was eighteen, a long time ago but I had a neighbor that shopped there every Sat. morning and she knew when they had certain things in stock so she would bulk up. Now I’m using HyVee delivery (health reason) and I love it. The delivery people are efficient and kind and if an item is missing or wrong, a call to store fixes it right away. Their shop online is very easy to use and you can check ingredients and nutrition of each item before making a decision. I’ve been using it for two years now and have never been disappointed. Good to know about the older Aldi — I just can’t stand that store, especially that you can’t get back to the beginning of the store without winding back through the entire store if you forget something! Also, YES, I downloaded the Meijer Express app but haven’t used it yet. I THINK I’m going to try to use it later this week — we’ll see!! We’ve been devoted Aldi shoppers for about 5 years now, when a store opened a block from our church. 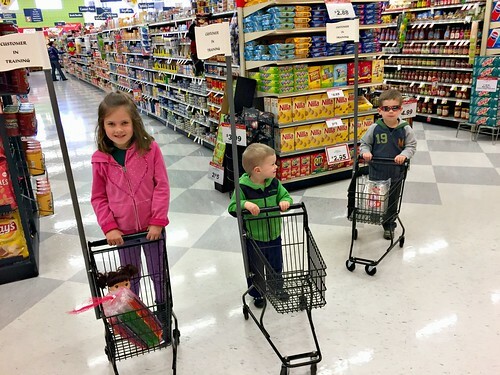 We go to Aldi every Sunday after church and with 2 adults + 2 toddlers we can get in, out, and home in 20 minutes. In those 5 years we’ve bought a house and had 2 kids, and as our free time has disappeared we’ve just stopped eating a lot of things that we can’t get at Aldi. It’s not worth the time and aggravation. There are a few holdouts – meat (Costco or local butcher), Diet Coke, and Green Giant Broccoli ‘n’ Cheese tots for my picky eater. So I have to go to Kroger and Costco once a month, and my husband handles the weekly butcher trip. Funnily enough, while in college in GR I worked as a cashier at the original “Thrifty Acres” Meijer at 28th & Kalamazoo (before it was torn down), and they treat their employees pretty crappy despite the union so I’m cool not shopping at Meijer. Forgot this yesterday but here is a little blog that reviews Aldi products and previews the ad every week! My least favorite topic/activity! I’ve been shopping at Aldi, since the first one opened in Holland … I was disgusted & frustrated with Save A Lot (not really!) So my husband & I go to Aldi, then Meijer. The difference for us, is that we can get most of our groceries at Aldi for less than Meijer or Wal-Mart. there are specific things we go to Meijer for, but we also get things from Amazon (health & beauty items). 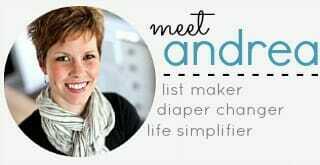 I like the mPerks at Meijer ( I don’t clip a lot, because I don’t use much name brand stuff, and last year I still saved over $800 (that’s a Paycheck) with mPerks and sales and I like the clothes they have, but if I shopped exclusive to Meijer, I know that I’d spend way more than necessary … too many temptations! I also prefer to bag my own groceries so I can sort before I get home. When I got to Meijer, I try to use the self check out, but the no limit lines are too long sometimes. I also like that most of the groceries I buy at Aldi are of the same quality as Meijer sometimes better, bust cost less and there are less selection between brands! (Most of which are produced by the name brands, just a different package – found that out after working at Heinze one year!) I hate waiting in line for longer than 10 minutes … I’m not very patient. 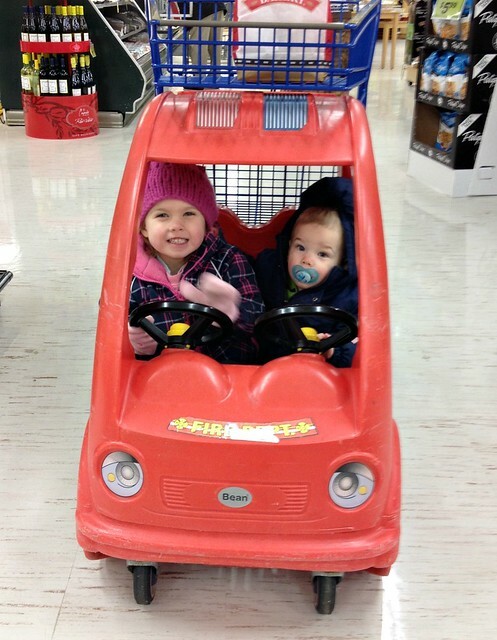 Grocery Shopping … Aldi makes it more tolerable. Each person/family has a way that works for them along with preferred stores. there is no right or wrong way to accomplish what you are trying to do. 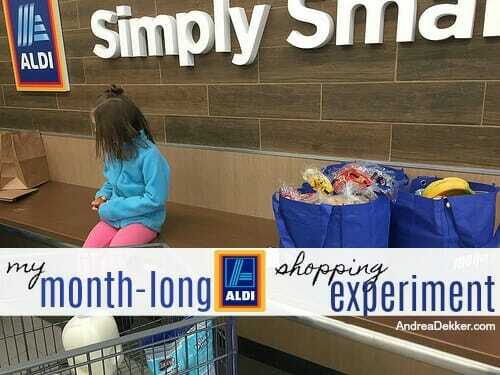 Thank you for sharing your experience with Aldi. The closet Aldi is 45 minutes away, so I’ve yet to try it. I have several friends who swear by Kroger, but it’s still 30 minutes away so that’s a no go for me also. My little rural town has 2 small regional chain groceries, a handful of Dollar Generals, and a “small” Walmart super center. My routine is to drop my older kids off at school and head straight to Walmart with my (just turned) 2 year old. There may be around 15 customers total in the store when I’m there at 8:30 in a weekday morning! 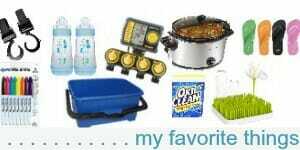 Walmart tends to be cheaper, with larger variety, and I can get everything on my list plus pick up any clothing items, pet items, or gardening supplies that are needed. I also scan my receipts with the Walmart app and get the difference if there are advertised lower prices on identical items from other local stores. I’m able to redeem those towards any Walmart purchase. Maybe I’ll change things up when my little one is in school and I have more time, but this works great for now! 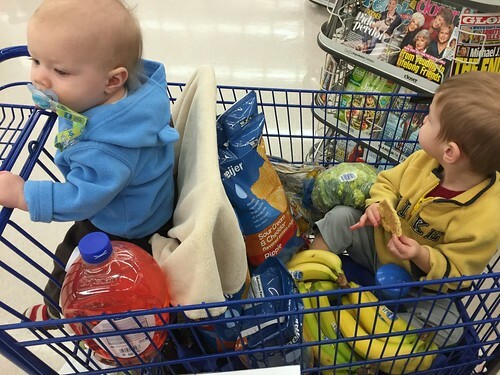 Grocery shopping…. I don’t think there is a one size fits all method. Meijer and Walmart try, and come pretty close, but there is not a perfect system. For me, Aldi and Costco take care of most of our family needs. I think I am down to about a once a month trip to Meijer or Family Fare. The few items (usually 4 or 5) I can’t get at Aldi or Costco, I have no problem running into Family fare to get, because it will be quicker, I’ll have less temptation to pick up other things there than the temptation I have at Meijer. All Aldi stores are supposed to be updated to the larger size or torn down and rebuilt. The larger store size and ease of switching from aisle to aisle are a benefit of the new layout and I hope the local older store in the area will get the new update soon. I do have a feeling Meijer will see my business more soon when it opens, because it will be the closest store to me. But our family has become almost “brand loyal” to some of Aldi’s products, so we will see actually how much of a difference it makes. Our needs and tastes do change, seasonally, so some seasons Meijer gets more of my business. But every time I shop at Meijer more our grocery bill goes up significantly. Probably because I am buying too many specialty items that the other two stores don’t offer. Wow, that’s crazy to wait in line 15-20 minutes to check out. While I’ve not lived by a Meijer, I did shop at Aldi almost exclusively 2007 – 2009 or so. Yes, it was an efficient shopping experience. Yes, it was a convenient location. However, I was not impressed with quality. Even before I was super health conscious, high fructose corn syrup and red 40 were not on my list of favorite ingredients. I switched mainly to Crest because their sale prices were better than Aldi prices. Keep us posted on your grocery shopping progress. Aldi’s store brand items do not have Red food dye (or any artificial coloring), and have not for as long as I have been shopping there (8+ years). I have always been a devoted Meijer shopper like you, but I have also come to like and appreciate Aldi for the speed with which I can get in and out. Certain things ARE much cheaper than Meijer (produce and bread, for example), but I can’t get everything I want at Aldi, so I still stop at Meijer periodically. I have been using my Meijer credit card to pay at Aldi, and as a result, I do see a slightly smaller Meijer bill lately (but can still get the credit card rewards for total amount spent!) I love that you kept an open mind and gave it a chance. It took me a while, too, but I don’t regret it! I’ve never shopped at Meijer, as there has not been one near the several places in the country we have lived. But I have shopped briefly at Aldi, just to check out the store and pick up a few items. I can see myself utilizing them a bit more in the future. We live in Northern VA, and an Aldi opened up about 2-3 miles from us a year or two ago (my how time flies!). One thing I noticed was that the shelves are stocked pretty much bulk style – they put the boxes up there and you get what you need/want. That part, with things being so crammed up against one another was bit chaos-y and disconcertingly overwhelming. However, I did buy some mushrooms and some shredded cheese during that visit, and I was SO surprised at how cheap those two items were over the other local stores (we have a Safeway, Giant, Food Lion, Walmart, Sam’s Club, Costco, Harris Teeter and a Wegman’s within a 3 to 5 mile radius of us). And the best part after I got home was that those really clean, white mushrooms STAYED fresh for several days after I got them home, and tasted delicious! I didn’t think about why that might have been, but since looking at GMO info lately, it made me wonder if they might have been GMO to be that white, that pretty and that clean and last that long. Usually mushrooms started deteriorating within a day or two. HOWEVER, I have also read that Aldi stores, or at least SOME Aldi stores plan on being totally organic. THAT would be such a game-changer if you could walk into a store and be SURE you were getting all organic food from it! We do have a couple of Whole Foods within a 7 mile and a 12 mile radius of us, but I don’t shop there due to some reported issues with some stuff they’ve carried. I sure hope your Meijer is aware of your blog and reads what you have written. Perhaps they will re-think their register issues for folks who have frequented their store and now are doing all to some of their shopping somewhere else. IMHO, they should in no way have ALL the registers working on groceries orders from that Shipt service at any time of the day, as Meijer will continue to lose customers if that keeps up. Maybe they are getting the profit margin they are wanting, but it is a new and ‘different’ thing and it will not be as popular after a bunch of folks have tried it out, then where will Meijer be after they’ve self-funneled too many of their regular customers off due to this waiting-too-long in the register line issue?? They are doing the other grocery stores in the area a huge service in folks trying them out due to their old faithful Meijer not being so faithful and whole lot more aggravating to shop in! In our area, I only go to Wegman’s if I need fresh produce for some reason, or a cake – they have a marvelous bakery! I quit going to Giant and Safeway and Harris Teeter, as getting in and our of their parking lots was such a hassle due to how they were designed. Giant is better now, so I do go there every so often now. My two most visited stores are the Walmart with the grocery store in it, in one direction from me (abt 3 miles) for mostly pre-packaged type foods, and the Food Lion in the other direction (abt 2-2.5 miles) for packaged as well as other things. Between the two I usually find most of what I need. I go to Walmart during the week before 1 to 2 pm to get out of there before the afternoon rush, and at Food Lion I can get in and out of there with no problem anytime, even on a weekend! I NEVER go to Costco on a weekend, but the Sam’s Club next to Walmart is not nearly as bad if we really, really need something. Thanks for this post on Aldi, I might just go back to them sooner rather than later now! Oh, and I am one of those people who detest coupons with the cutting, sorting, filing, finding, forgetting and losing them at times. I just decided I would shop sales and stores that weren’t so expensive and do without the hassle of the coupons! We have no Meijer or Aldi here. Sad 🙁 But I tried a three week experiment after the last full service grocery store closed here, leaving me with a few not-really-desirable options, to travel to Trader Joe’s three towns over requiring driving on freeways to get there, or going two towns over on congested neighborhood streets the direct opposite from Trader’s J’s OR travel over a toll bridge to the nearest location of my store I lost. Here’s the dilemma I faced with TJ’s. Their sour cream, cream cheese and cottage cheese and heavy cream all contain carrageenan. So immediately I’d have to go elsewhere additionally if I went there. And they do not carry the household necessities I use. Costco is good if you need 50 rolls of TP but it’s only two of us and one works full time. And storage is a major issue buying in bulk. We have a very small house. So I toyed with alternating between stores and tried to save on gas (California has this insanely expensive gas thanks to an insanely crazy eco freak government) so I’d go to Costco and stock up on meats and chickens, wine and k cups one week and then go to Trader Joe’s and buy my favorite dry goods. And yet another week over the bridge to get my lunch meats and nut flours. I was getting tired of this! So I did a three week (ended early due to I hated it)experiment at the discount off brand grocery store. For three weeks I tried the discount store brands that replaced my old favorites. I got poor quality meats and produce, unfamiliar canned goods, and they don’t bag or help to the car, they use conveyer belts. I bought a case of water and realized I had picked it up 4 times. At Trader Joe’s they will load it if you ask, and you just tell them at checkout. You don’t ever have to touch it and hopefully you have a spouse who has two good shoulders and a strong back to wrestle it out of the car. I ended up trimming so much fat and gristle from my meat and chicken, could not find fresh fish, and occasionally one of the very commonplace vegetables would be out of stock and I still had to go somewhere else. I was frustrated tired my feet hurt my back hurt so…. I started ordering every household product I could from Amazon Prime Pantry. I got all my favorite brands and sizes like Downey and Tide and Charmin and Dawn. I know, they have no coupons to speak of but the prices are good and I don’t get a paper anymore so no coupons anyway. The second part of my plan was to continue to shop at my favorite full service store, but to drastically change my buying habits. I stopped buying prepared foods like shredded cheeses and bagged lettuce or pre chopped onions. No more cake, cookie, brownie, pancake mixes. No more liquid egg product. No salad dressing in bottles or soup in cans. I started doing it from scratch and despite eating a grain free fairly high protein organic diet I still saved money. Here’s something else. We all have appliances – like food processors and hand held blenders and standmixers that were not put to good use because we were buying packaged cookies and boxes of brownie mixes that mix up fast with a spoon. My compromise was go to a store that takes care of me, has quality food, and rely on my own ability to cook. So, here’s what I made this week that I would have bought partly already or completely done a month ago: brownies from scratch. Red Lobster cheese biscuits from scratch. Potato salad. Mac and cheese. I actually grated the cheese and lived to tell the tale. Oven fries. Salad dressings including thousand island. Mayo. Ice cream. Yogurt. We don’t eat a lot of grains so I sub in cauliflower for rice and pasta frequently so I bought Heads, not shreds. For a weekend camping trip I saved nearly $100 by planning and cooking ahead.All my baked goods were using gluten free almond and coconut flours – not cheap, but I still saved. I guess my conclusion was if I have to spend half a day in my car it better be worth it. Brand name products make a huge difference in quality. I’m happy with my decision. Good for you cooking from scratch. Now to kick the kcup habit and bottled water too, that would be a great step for the you and the environment. Is the tap water in California not suitable for drinking? Seems odd to need to buy bottled water in the US. California water is fine, some people just like to buy bottled water I guess. I agree that Kcups are awful, the man who invented the system says he regrets it deeply because of the hellacious amount of waste they produce. I enjoy shopping at Aldi especially since it opened in Grandville just 2 min. from my condo. I get most of my baking supplies, except flour (I only use King Arthur) These items are so much cheaper even with the m-perks etc that I also use. I visit Aldi every other week, and spend about $50.00 or so, and what I can’t get there, I then go to Meijer which is another min. down the road. I like the fact you don’t have to pick between 5-10 different brands for each item, and that saves time. I have found very few, if any, items I don’t like at Aldi, and if there are you get your money back. I agree Meijer checkouts are awful!!!! I went Sunday, (which was a new experience, but circumstances were beyond my control) and I waited in line 40 min. and each line was the same, and no rush to open additional lanes. I seen people leave their carts & walk out. This was the worst I’ve ever seen it. Usually 20 to 25 min wait which is still bad. All in all, each store has its good & bad points and it’s nice to have a choice. 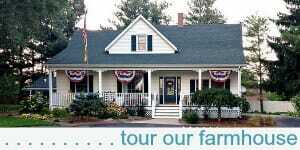 We got a Mejiers not too long ago 2 towns over, so I have been a few times. I never have had to wait more than a minute or two to check out. Selection and quality pretty good, but almost twice as much money as Aldi on many things I buy. So, like lots of us, I rotate between several stores. It’s all about planning ahead, for me.